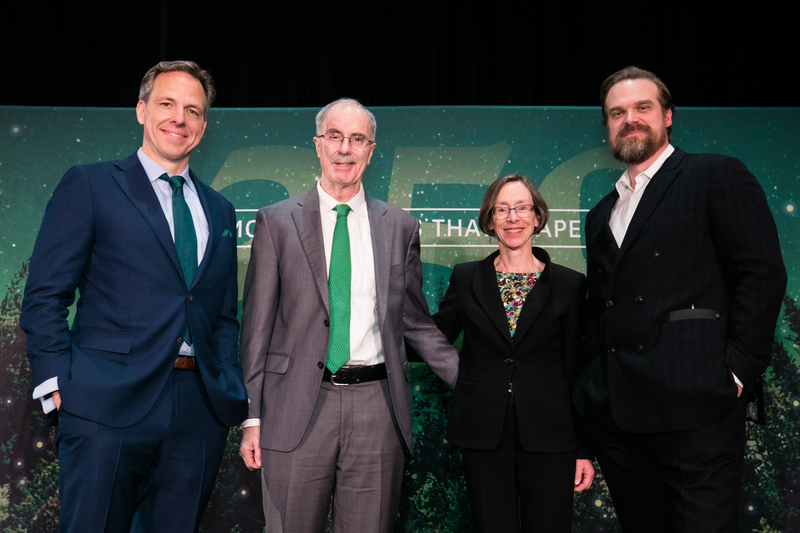 Two days after the official kickoff of Dartmouth’s 250th anniversary in Hanover, Dartmouth Alumni Relations took the party to New York where alumni, family, and friends celebrated with some high profile guests. 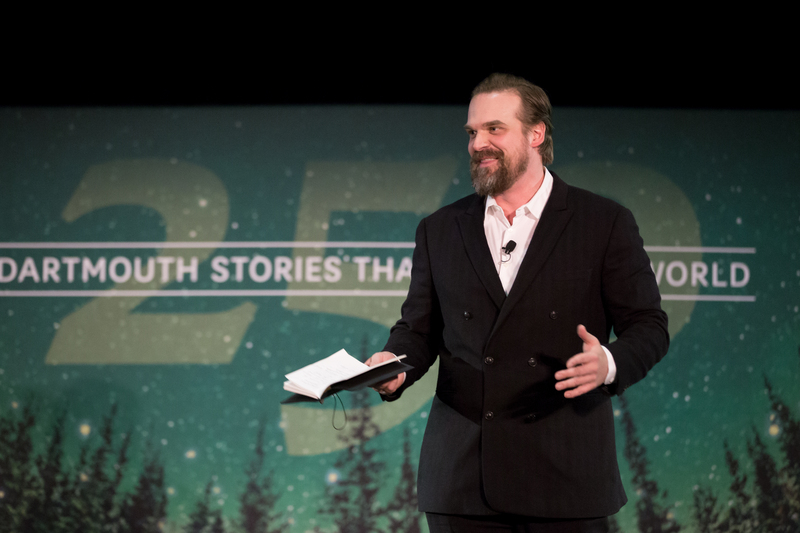 Jake Tapper ’91, CNN anchor and chief Washington correspondent; and actor David Harbour ’97 of Stranger Things and the upcoming Hellboy, headlined the January 12 event to the delight of nearly 500 guests. 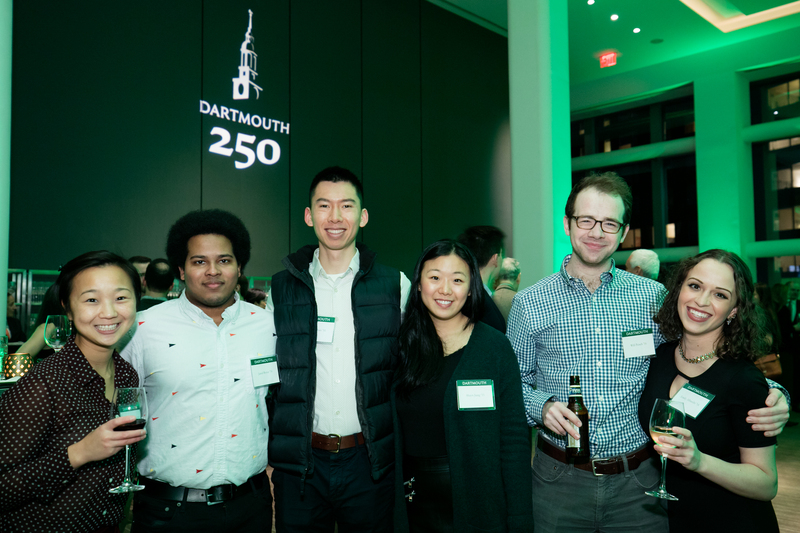 The New York skyline went green to celebrate Dartmouth's 250th. Photo by Mark Washburn. 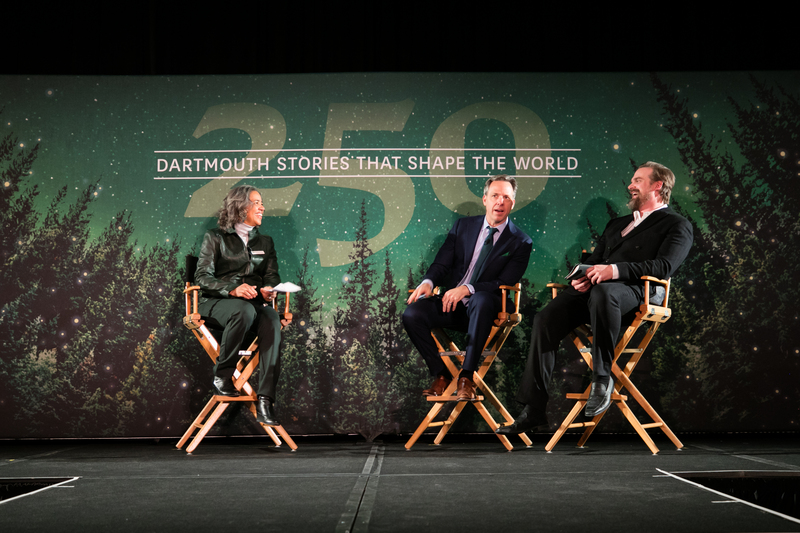 Through the theme of “Dartmouth Stories that Shaped the World,” Tapper and Harbour recounted the transformational power of their Dartmouth experiences. 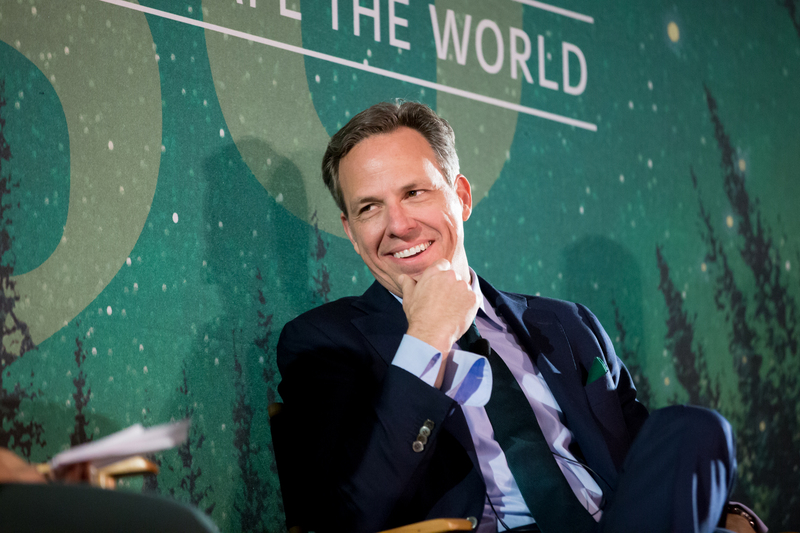 For Tapper, drawing cartoons for The Dartmouth was a chance to learn how to receive criticism and develop a thick skin, and Dartmouth’s “laboratory of ideas” provided space to engage with differing viewpoints – both valuable skills for a political journalist. Harbour shared how the arts at Dartmouth and his exposure to the entertainment industry shaped his imagination, noting that Dartmouth “taught me how to think.” A theater major at Dartmouth, Harbour said that a guest lecture from playwright Tony Kushner gave him the confidence to dive into life as an artist. 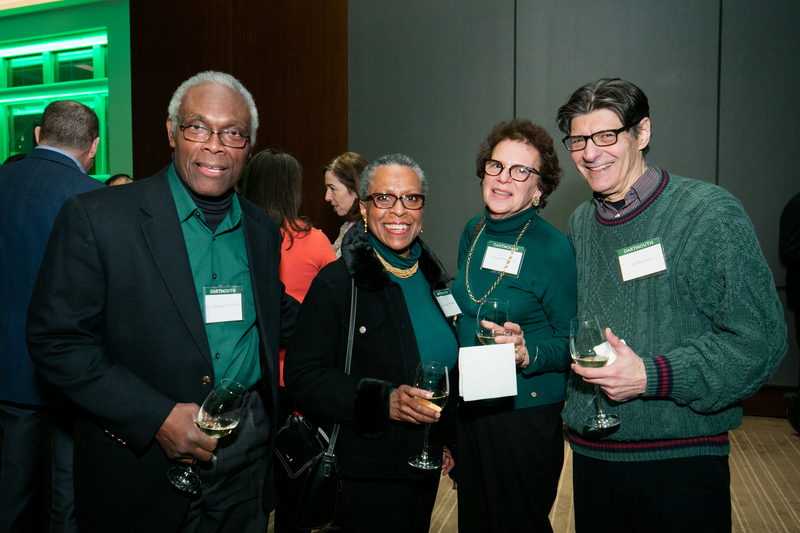 President Philip J. Hanlon ’77, Vice President for Alumni Relations Cheryl Bascomb ’82, and Provost Joe Helble offered their Dartmouth tales as well, from a poor grade that led to a College presidency to a first glimpse of Dartmouth in freshly fallen snow. Guests were also introduced to stories of student entrepreneurs whose innovations are shaping the safety and wellbeing of humankind. John Currier ’79 Gr’81 Th’81 and Kendall Ronzano ’17 demonstrated how the Mobile Virtual Player is being adapted for use by the military after proving an effective tool in combatting concussions on the playing field. 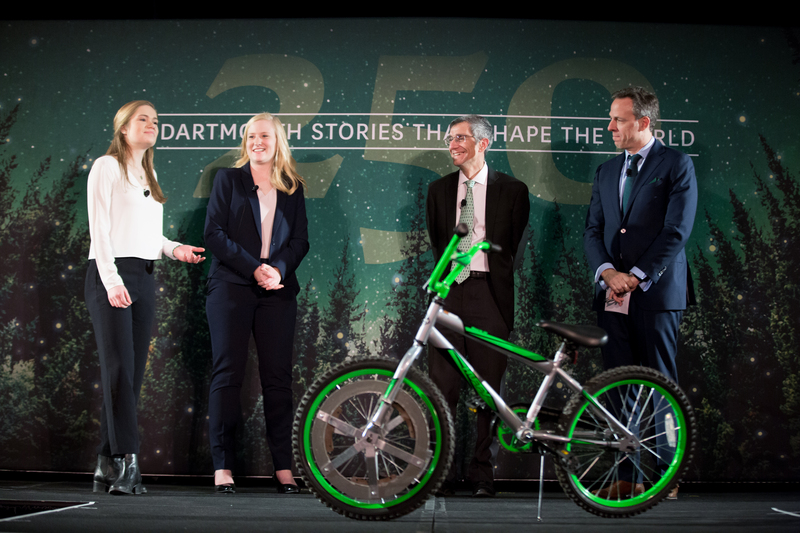 Alexandra Stasior ’20 and Julia Marcottte ’20 discussed their invention, Speedbreak, which aims to prevent injuries among children riding bikes. 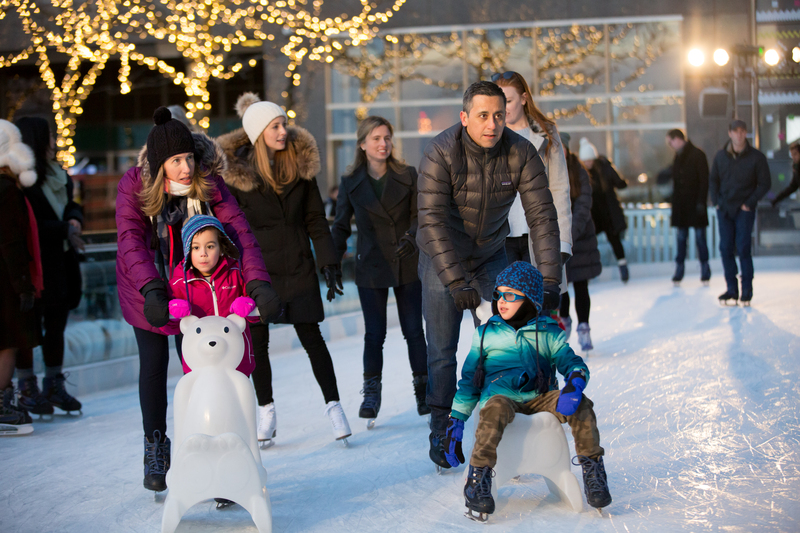 Prior to the program and undeterred by sub-freezing temperatures, nearly 150 alumni and friends took to the ice at the Rink at Brookfield Place in Battery Park. 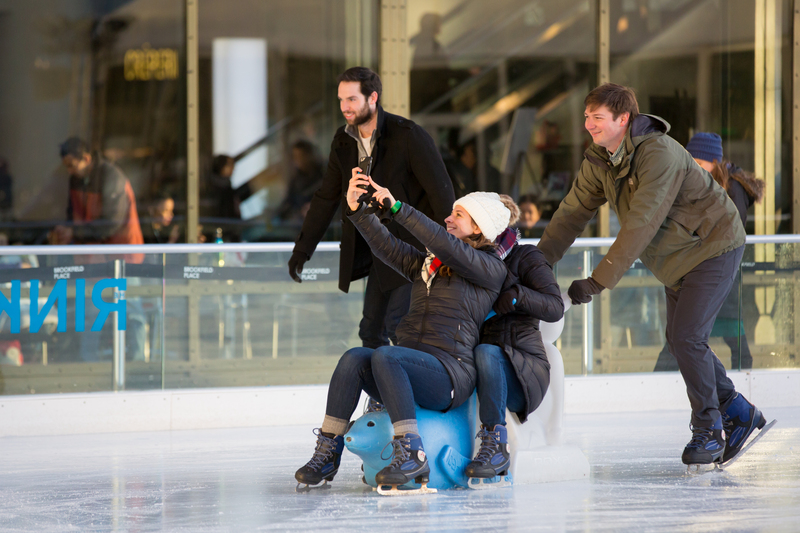 They relived their days of skating on Occom Pond, warming up with hot cocoa and Dartmouth a cappella tunes. 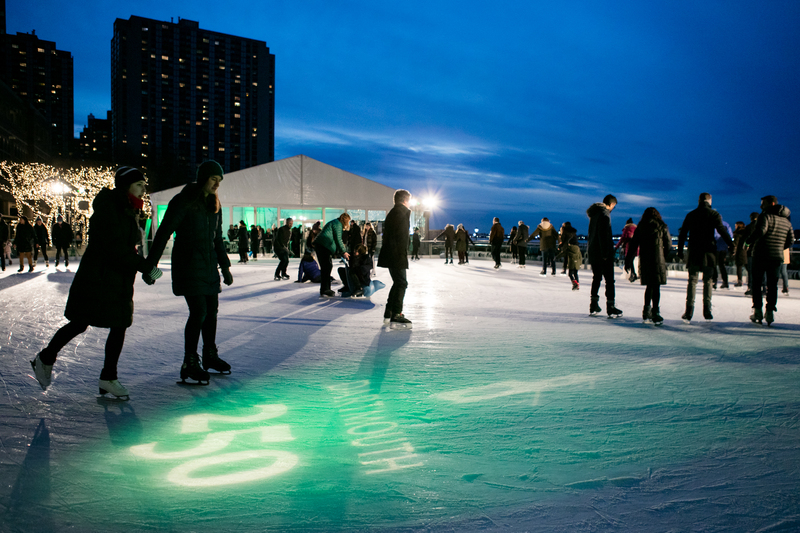 As guests departed for the evening, they were greeted by a green-lit New York City skyline. 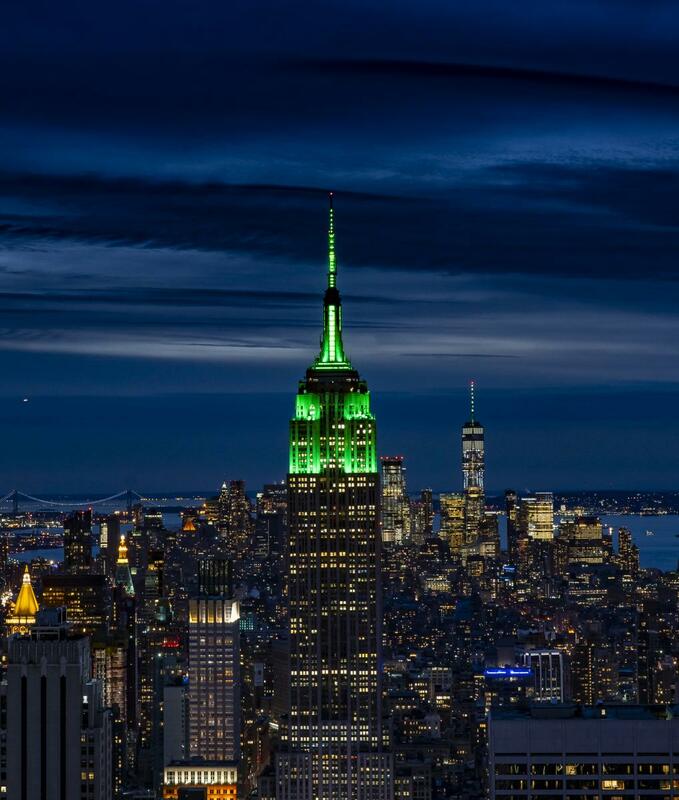 Three New York buildings – One World Trade Center, the Empire State Building, and 7 Bryant Park – participated in Greenlighting Day, when 17 landmarks, buildings, and attractions around the world were lit green in honor of Dartmouth’s sestercenntenial. Another Greenlighting Day is scheduled for December 13, 2019, when the College will celebrate Charter Day at the close of the anniversary year. Couldn’t join us on Saturday? The 250th celebration is just beginning! 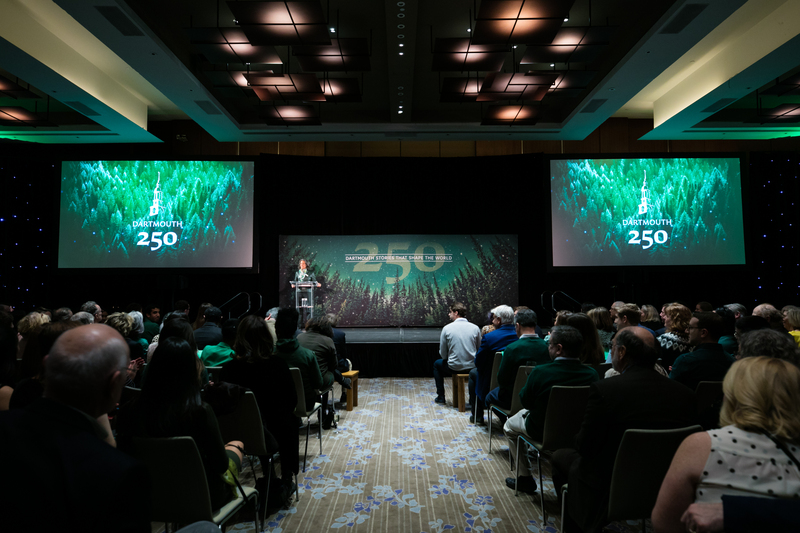 Check out upcoming events and follow the action with #Dartmouth250 on social media, and view a full album of photos from the NYC event.